In connection with a recent consultative meeting of secretaries of World Confessional Families held in Rome, B. B. Beach, secretary of the Northern Europe-West Africa Division, one of the 15 partic­ipants and the only Adventist in the group, presented a book and a medallion to Pope Paul VI on May 18. The book presented was the Adventist missionary book Faith in Action, and the me­dallion was a gold-covered symbol of the Seventh Adventist Church. The me­dallion is an engraved witness to the Adventist faith in Christ as Creator, Redeemer, and soon-coming Lord, in the cross and Bible, and in the lasting validity of the Ten Commandments. While the other commandments are represented simply as Roman numerals. the words of the fourth- 'Remember the sab­bath day, to keep it holy" ­are written out. This vision proves the Seventh-day Adventists are not "the saints" that will be persecuted during the end times. Instead, Ellen White says that the saints will be "an obscure people" or relatively unknown to the Catholics. The SDA sect cannot possibly be described as "obsure" to the Catholic Church. The Seventh-day Adventist Church has been well-known to the Catholic Church for a long time. In the 1800s the SDA Church was decidedly anti-Catholic in their rhetoric, but softened in the late 1900s. 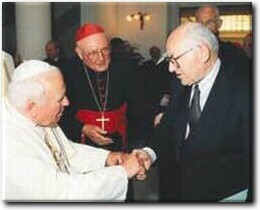 In 1977, Religious Liberty Director Bert Beach (pictured on left) strengthened ties between the two churches by presenting a golden friendship medaliion to the Pope (see news report in the Review on the right). Through continuing dialogue and participation in ecumenical meetings, the relationship between the Papacy and the SDA Church has continued to grow even stronger over recent decades. At that meeting, pastor B.T. 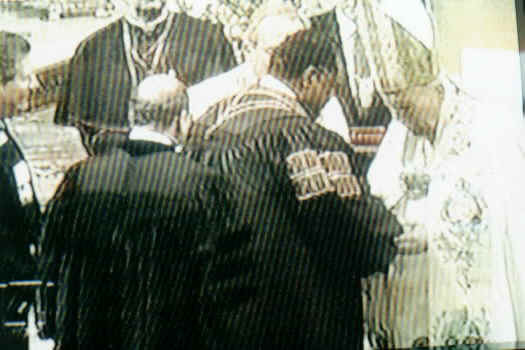 Rice of the Northside SDA Church (pictured on the right) presented a proclamation and banner to the Pope. Exemplifying the close bond between Adventism and the Papacy, Pastor Rice spoke to the congregation, addressing the Pope with the reverent title, "Pope, your Holiness." In 2000, after 15 years of "dialogue aimed at better understanding of the teachings and practice of the Catholic and the Adventist Churches," the SDA Church signed a "pact" with the Papacy in Warsaw, Poland.3 Apparently the SDA Church is not very "obscure" to the Catholic Church, having spent 15 years in "dialogue aimed at better understanding." In a vision, Ellen White said the "saints" who would be persecuted for their beliefs in the Sabbath were "obscure" to the Catholics. If one accepts this as a true vision from a true prophet, then one must also concede that Seventh-day Adventists are not "the saints." It is, in fact, impossible for them to be "the saints" because they are by no means "obscure" to Catholicism. The SDA sect is well known to Catholicism and to the Pope. The two organizations dialogue together, attend ecumenical meetings together, exchange gifts with each other, and even do healthcare business together. Either Ellen White's vision was a falsehood, or else "the saints" are not Adventists. You decide. 1. Ellen White, Spalding and Magan Collection, p. 1. 2. The Dayton Daily News, Jan. 28, 1999. 3. "Adventists and Papacy Sign Pact", Adventist News Network, Feb 15, 2000. 4. Our Sunday Visitor, p. 1, Jan. 7, 1996. 5. http://www.adventist.org/world-church/facts-and-figures/index.html, June 30, 2011. 6. Antigua and Barbuda, SDA=12.3%, Catholic 10.4%. Jamaica, SDA=10.8%, Catholic 2.6%. Pitcairn Islands, SDA=100%. (Source: http://www.nationmaster.com/graph/rel_rel-religion-religions). Anguilla, SDA=6.7%, Catholic=3%. Montserrat, SDA=8.33%, Catholic=8.33% (Source: www.adherants.com). "Religions by country", CIA World Factbooks, 18 December 2003 to 28 March 2011. 7. "About Us", http://www.adventisthealthsystem.com/AboutUs.aspx, extracted June 6, 2012. 8. Wikipedia, "Christian School", http://en.wikipedia.org/wiki/Christian_school, extracted June 6, 2012.